We know that there will be a large exhibit celebrating Pirates of the Caribbean in all its forms in all the parks worldwide. A couple of weeks ago, Disney caused a stir by announcing there would be changes in the venerable attraction, one of the last that Walt Disney worked on in Disneyland. After 50 years, the “bride auction” scene — admittedly, a human trafficking scene — would be altered, with the key figure known as “the redhead” altered from object to pirate herself. 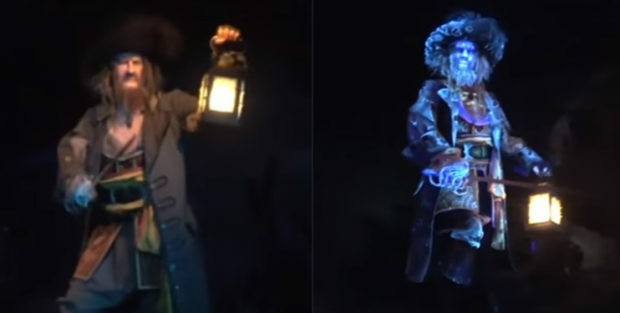 Check out the new Barbossa figure — somewhat along the lines of the effect at the Shanghai Disneyland Pirates attraction with the Davey Jones figure. Will this figure be added to the Anaheim version? Perhaps we’ll find out this weekend.